SXSRams - Hemet CA Fantastic And Great looking "I didn’t know it would be as bright as it was but dang. 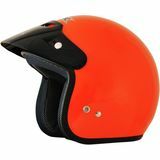 It’s bright and it looks awesome, sporty and sleek. It was a tight fit at first but now it’s taking the shape of my head great. My only issue is the fogging. It fogs up pretty easily. The shield stays where you put. I don’t have any issues with it going down or flying up. Had the fogging been better, solid 5 out of 5"
Erin - Maine Perfect kids helmet "I bought this helmet for my two year old for snowmobiling. We added a bubble shield to keep her warm and it fit perfectly. We got her a small and it’s definitely has room to grow and should fit her for a few years. 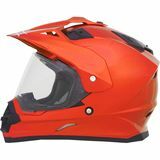 My review is really for their outstanding customer service, I called with a couple questions and the guy I talked to went above and beyond to help me find the right helmet and shield to fit it."